Polluters Required To Pay For Greenhouse Gases Big power companies in Maryland, Maine, Massachusetts, Vermont, Rhode Island, and Connecticut will be required to buy allowances for every ton of gas their plant emits. The auction of greenhouse gas allowances is part of a plan to start reducing carbon emissions. Four other states--New York, New Hampshire, New Jersey and Delaware, will participate in later auctions. On Sept. 25, several Eastern states will make history by holding an auction. They're selling allowances to emit greenhouse gases into the atmosphere. If you're a big power company in those states, you'll have to buy an allowance for every ton of gas that goes up your smokestack. It's a big step toward a carbon market in the United States. It means slapping a price on the biggest greenhouse gas, carbon dioxide. If you put it up in the atmosphere, you'll have to pay. If you get rid of it, you can make money. Economists call it the "market-based" way to make people do things they don't necessarily want to do. Ten states in the East have joined together to start the process. Jonathan Schrag is in charge of this group, called the regional greenhouse gas initiative (RGGI). They're organizing the first market-based, mandatory program to control greenhouse gases, starting with companies that make electricity. "Every ton that they emit starting Jan. 1, 2009, they'll need to have an allowance to show for that," says Schrag. 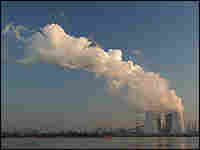 Companies must buy the allowances at the auction — enough to cover the amount of carbon dioxide they think they'll emit. The states get to keep the auction money, says Shari Wilson, who runs the Department of the Environment in Maryland. "Our best estimates are that the price of an allowance will be somewhere between $2 and $3, which in Maryland in this first auction, for example, at least will raise about $15 million in revenue." Wilson says the money they'll make will help lower greenhouse gases by underwriting energy conservation projects for consumers, such as winterizing homes or finding more efficient appliances. "The good news," says Wilson, "is that people should be paying less for their electricity if you participate in energy conservation." In addition to Maryland, the states holding the auction are Maine, Massachusetts, Vermont, Rhode Island, and Connecticut. Four other states--New York, New Hampshire, New Jersey and Delaware, will participate in later auctions. Each state has a cap or ceiling for carbon dioxide emissions set by RGGI. Over time, that cap will shrink and the states will have fewer allowances to sell. Power companies will have to compete for these and that will drive the price up. Eventually, that will force them to adopt new technology to lower emissions — hopefully, by 10 percent in ten years. RGGI's Jonathan Schrag notes that the Congress has been drafting several bills to create a cap and trade carbon market like this for the whole country. "RGGI really is setting an example for what a national approach for reducing greenhouse gas emissions might look like, how that might work," says Schrag. At the moment the cap is pretty generous for carbon emissions. As the cap shrinks, demand for allowances could exceed the state's supply. So the market has an escape valve. A power company can go outside of RGGI and pay someone to reduce greenhouse gases somewhere else in the world. Someone like Ecosecurities, a company that finds opportunities to reduce greenhouse gases at a competitive price. These reductions create carbon credits they can sell. EcoSecurities' Aimee Barnes says her company needs to know how much an American company is willing to pay, then it can go out and fund some gas-cutting projects. Barnes says this could include "projects that reduce greenhouse gas emissions from manure at farms, or from landfills, reforestation projects, things of that nature." EcoSecurities is just one of many operators in this new market who will be watching the auction closely. With 188 million tons of emissions up for sale in the first go-round, a lot of money will be changing hands in the name of a cooler planet.